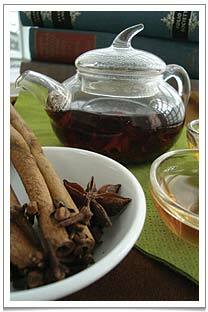 Lychee Black Tea with cinnamon, cloves and petals of star anise – the perfect mulled “wine” for teetotallers. Lychee Black Tea (荔枝红茶 lizhi hongcha) is a well-known scented black tea from Guangdong province (in south-east China). Most tea lovers immediately fall in love with the deeply perfumed flavours of this tea, others are impressed with the intense fruity sweetness that reminds them of fresh lychee fruits. Lychee Black tea leaves’ appearance is unremarkable: tight, thin and evenly packed. One may see a few golden strands indicating tenderness. But if this blog could only transmit smell! The deeply intense lychee perfume is intoxicating – almost like you are eating the sweet crisp juicy flesh with a hint of citrus. From a Chinese traditional medicine perspective, Lychee Black tea can relieve fatigue and is Yang in nature so is very suitable for drinking during autumn and winter as an antidote to the Yin season. 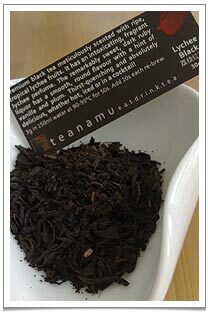 teanamu Lychee Black Tea – Absolutely delicious, irresistible, with an intoxicating tropical fragrance. In Chinese terminology, black tea is known as “Hong Cha” (红茶, literally translated as red tea) and what is known as “black” tea (黑茶 Hei Cha) actually refers to the post-oxidised teas like Pu Erhs and Liu Bao Cha. Black tea can be further classified into black congou teas (gongfu 功夫) like Keemum black, black broken teas (hongsui cha 红碎茶) like English Breakfast blend, and Souchong black teas (xiaozhong 小种) like Lapsang Souchong. Congou black tea leaves are scented with fresh lychees by simply layering tea with lychee on bamboo sieves and then a very light roasting afterwards. The natural sugars in the black tea, caramelised during the scenting and roasting processes, give it an opulent, mahogany colour and a deeply fragrant aroma. Lychee Black tea must be the earliest “fruit-flavoured” tea as it has a long history that can be traced back to the times of Consort Yang Yuhuan (杨玉环 a.k.a. Yang Guifei 杨贵妃) in the Tang Dynasty. Consort Yang was known for her remarkable beauty and for having a full, cherubic figure and she was the favourite wife of the Tang Emperor. She is often associated with Lychee as it was her favourite fruit. Lychee fruit is grown in the Linnan (岭南) area but Consort Yang lived thousands of miles away in the capital city of Chang An (长安). But for the beloved consort of the Emperor nothing was too much! He decreed that lychees be delivered on horseback to the capital city on a daily basis! At that time, Black Congous were made as ‘tribute teas’ to be offered to the Emperor. What better way of currying favour with the Emperor than to scent your tribute teas with lychee for the delectation of the Emperor’s favourite consort? Brewing this tea cannot be easier. 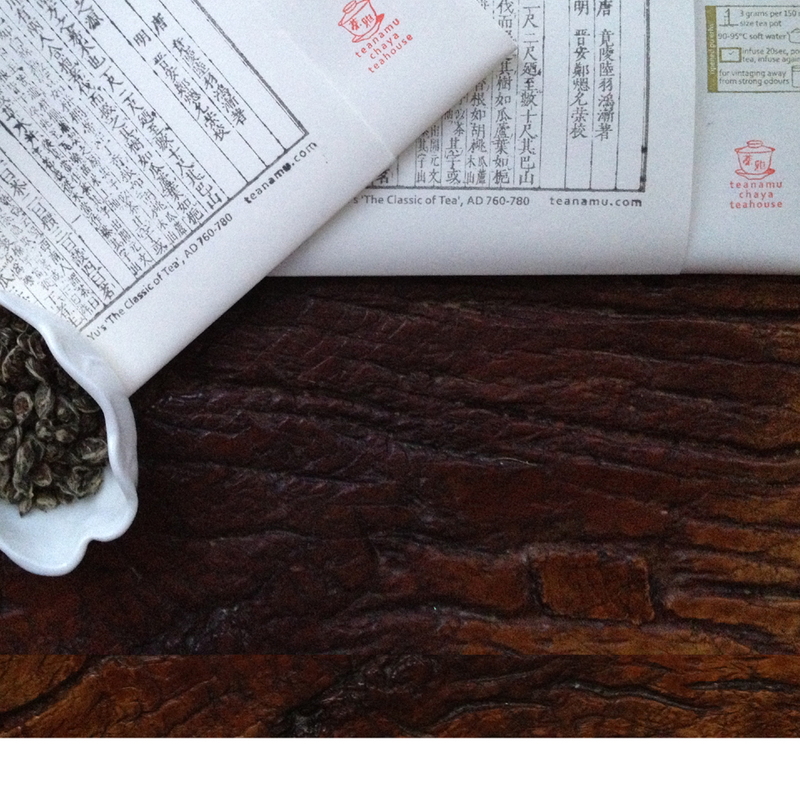 Place 3 grams of tea leaves in a warmed pot or gaiwan. Pour hot water at around 95°C into the pot in a circular motion allowing the tea leaves to dance in the pot. Steep for 40 seconds and pour out the tea. This can be repeated for 2 or 3 further infusions. One can also do a ‘cold brew’ version of this tea. Simply place 10-15 grams of the tea leaves in a 1 litre jug of soft water. Allow to infuse in a fridge overnight and you get a delicious and naturally sweet cold Lychee Black tea which can be used as a base in fruit punches, for example it’s glorious with Pimms and summer fruits! Don’t get me wrong! I think the oriental lychee fruit is a really Christmasy flavour. Sweetness aside, it echoes the warm cinnamon, clove and citrus fruitiness of mulled wine. Several celebrity chefs have concocted alcoholic ‘Lychee-tini’ for Christmas. But for those like me who are teetotal, a warm cup of Lychee black tea laced with tinned Lychee fruit, a sprig of mint and the slightest hint of cinnamon, clove and star anise is the perfect Christmas ‘mulled wine’. Yummy! If you like to try some of the delicious non-alcoholic mulled Lychee Black “tea”, pop by to our “Have Tea Will Drink” tea tasting events on 12 December and 19 December from 12 to 4 pm. – To make Lychee Black Vodka: Infuse 3g Lychee Black Tea in 50 ml vodka for 4-5 hours. – Muddle the lychee fruit and all the ingredients a good shake. – Decorate with lemon slice and one lychee fruit in each cocktail glass. – Lightly blanch the lychee, pat dry and set aside. – Beat the egg whites till soft peak stage and add 10g corn starch (optional). – Heat the oil in a saucepan. Light dust the lychees with some corn starch. Coat it with the beaten egg whites and deep-fry till golden. Remove from the oil and set aside. – In a separate sauce pan, add a little oil and the honey and the oil. Allow the mixture to thicken and very lightly caramelised. – Return the fried lychee balls to the caramelised honey mixture. Lightly coat and serve hot with a pot of Lychee Black Tea. Robert Fortune: tea thief or hero? What a coincidence… I switch between my teas and just a couple of days ago, switched back to Lychee Black! Welcome back to Lychee Black tea .. I think it is v christmassy.